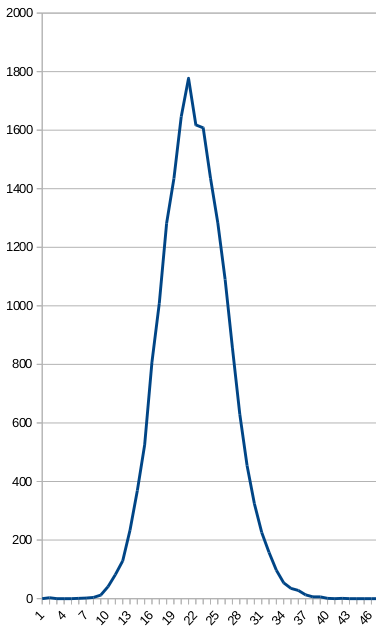 Every day a seem to have one or two data spikes between 140-155 CPM, often around the same time of day. I doubt it's triggered naturally. What might it be? My data's on h**p://www.gmcmap.com/historyData.asp?param_ID=71736386667 if anyone wants a look. Is there a firmware upgrade from 4.11 for the GQ GMC-320+V4? This graph of CPM, most recent to oldest, gives a feel for what I'm asking about. My first thought was perhaps RAF training flights with forward radar scanners overhead but I think the narrowness of those two bands would be impossible if that were the case. Problems on the USB lead emulating serial protocol might have corruption but that would never be accepted as a valid data point. I'm sure the bands originate in the GMC-320+V4 itself. And as the earlier URL shows, it's not just mine. Here's the hour of the day frequency for the two bands, the higher CPM on top and the middle CPM below. I think they're random. A couple more plots, the top is CPM distribution in the range 0-50 and the bottom is the CPM distribution for the two narrow bands - please add 130 to the x-axis values to get the actual CPM. I think all three distributions are all normal though I'm puzzled by the notch at the top of the first plot. The other detail is that two time periods make up the data. Looking at the first graph, everything to the left of reading 12060 is from the last fifty days. Everything to the right is from September 2016, and while the two sides are different they both show the two narrow high-count bands. I hadn't intended to include the 2016 data but it's interesting that the effect has lasted across the whole 16 months. The "I'm puzzled by the notch at the top of the first plot" might be related. 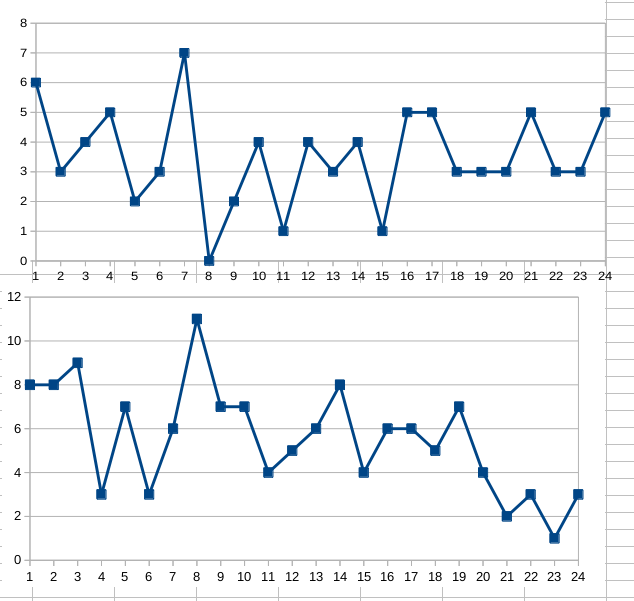 It's evident that the data shows (at least) two periods differentiated by an average two CPM. Whether that's a result of a shift in the background radiation, or a shift in some other environmental factor which has affected the meter, isn't evident. I'm sure I relocated the meter from a drawer to the tabletop during the intervening period covering the measurements. That could easily be responsible, and seems far more likely than a change in background radiation. Interesting and puzzling result. These spikes surely do not come from anything real. Likewise those from the other chap you linked to. They are always single offs in a sea of normal background values. My guess is, it is a software issue, perhaps in the recording software. Your background is 22, add 128 (=2^7) and you get 150, add 256 (=2^8) and you get 278. These would be single bit flips. The agreement with your data is unlikely just by coincidence. What software are you using to collect the data? Can you see these excursions also on the counter or are they visible only on the computer? Have you downloaded the history from the counter and does it have the same spikes? If so, did you repeat the download and were the spikes at the same position? You're quite right about the 128 data point. I'd been using the GM Counter Data Logger STD V5.52 unregistered, putting the data straight through to the gmcmap page, so the second-by-second data wasn't visible. I registered the software yesterday and upgraded to V5.56, and set the radiation alarm to anything over 100. It went off at 4 this morning. 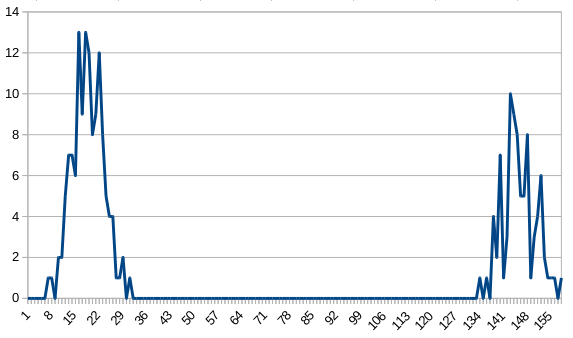 The saved csv shows a reading of 128 in the second-by-second breakdown. I presume two of those in the same minute would account for the 256 sum. I'll ask support to comment in the thread here, or at least express an opinion. The problem could be either from software or tube. 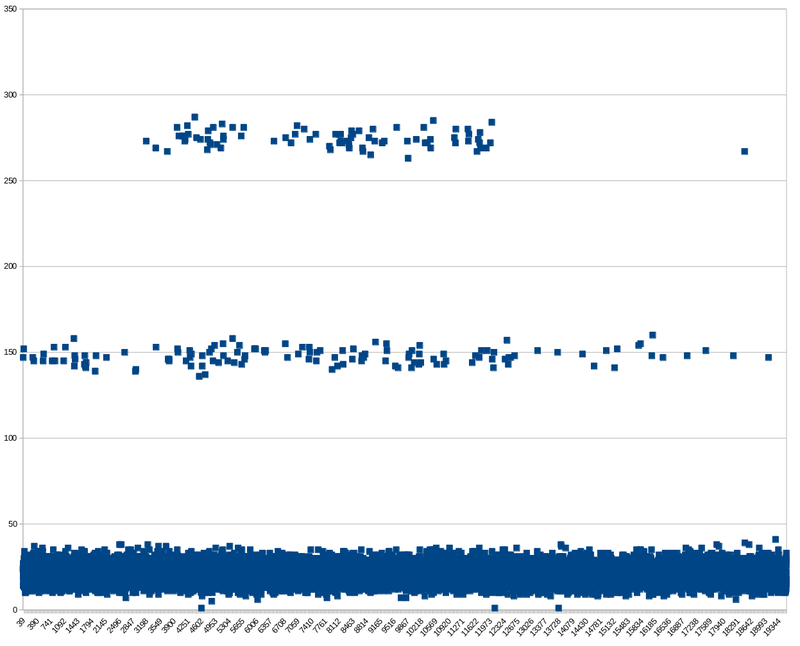 Download the history data in .bin file and check if the spikes exist in raw data. You can check it yourself or send it to support@gqelectronicsllc.com for verification. I did not understand: where was the alarm set, at the PC or at the counter. Since you mention CSV, I guess it was on the PC? The counter didn't say anything? Do you get the same spike when you only run the counter, NOT connected to the PC? As ZLM suggested, download the history from the counter! It is probably the time snyc between the device and the software. It is the same with my 320 Plus V4. Everytime the time sync is done the reading is high for one count or one minute.